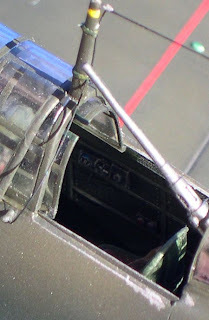 There is not much evidence for the interior colour of the Kugisho D4Y Suisei Navy Carrier Bomber (Allied Code Name 'Judy') but Robert C Mikesh has identified cockpit component parts as being comparable to Munsell 7.5 GY 3/4 (A/N 32 from his 'Aircraft Interiors' book) and Pantone 5747C. There are no close FS matches to these colours but hopefully the rendered chips will give you an idea of what they look like. 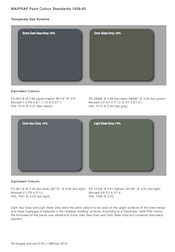 Humbrol 149 Matt Dark Green and/or 76 Matt Uniform Green seem reasonably close to the Munsell, but there is nothing in the Humbrol range close to the Pantone. Revell's silk-matt 363 Dark Green is the closest but still not quite rich enough in green chroma. 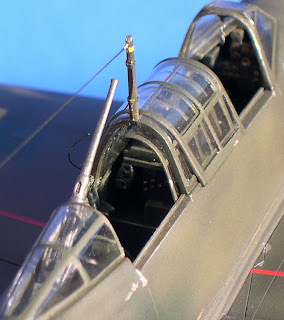 The beautiful D4Y2-S Judy nightfighter model was built by Dan Salamone from the Fine Molds kit and nicely replicates the "buff" finish of the undersurfaces. 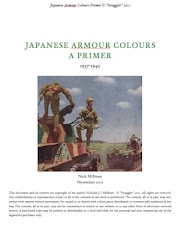 Dan used Asahi Journal Volume 4, Number 3 as his main colour reference source. 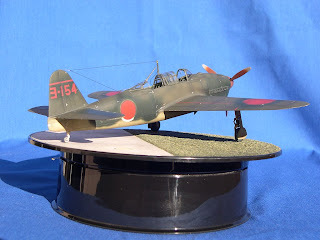 Tamiya XF-61 was used for the upper surface dark green, with XF-11 used for the overspray of the fuselage hinomaru outlines and other touch ups. The lower surfaces were XF-49 and XF-20 but mixed to a different ratio from Dan's superlative Zero model. 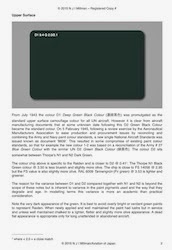 All colours were thinned with GSI Creos Mr Color lacquer thinner and also with Mr Retarder to slow the drying time. 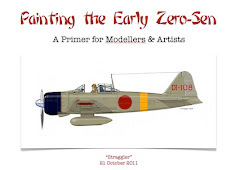 Dan described building the Fine Molds kit as challenging but rewarding. He used vacform parts on the canopy so that he could position the sliding parts open to show off the wonderful interior detail. Dan used Tamiya masking tape cut into thin slices to replicate the bands holding the antenna wire to the mast for the unconventional rigging. 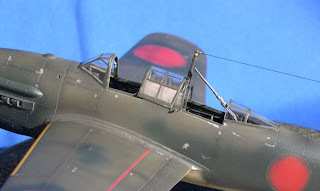 Some details were missing, such as the canopy slide rails and main landing gear door actuation. Some were not molded in the correct positions, such as panel lines. The rear fairing behind the canopy is also too shallow and the solution was to build it up with epoxy putty then to sand back to the correct shape. The fit of parts was difficult; Dan decided to attach all the inserts, such as the lower fuselage, upper cowling, etc., to one of the fuselage halves to ensure a perfect fit, then sanded/filled the other side as needed. This aircraft was unusual in that the original clear rotating part of the rear canopy was retained whereas all other known D4Y2-S had a mostly solid metal rear fairing. Another great job, Dan. Thanks for sharing the photos of your kit. 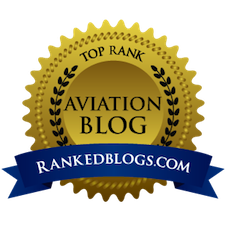 Thanks for the kind words....hopefully sometime soon I'll have images of my current project to share as well. I had seen this on the Arawasi site some time back but forget how fine it was. This is really an inspired build of a kit with its share of glitches. It's great to see a subject that hasn't been done to death markings-wise. 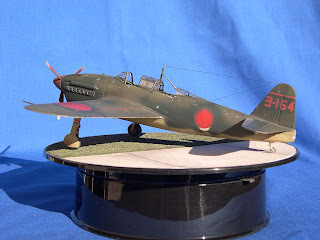 Anyway, one of the best models of WWII Japanese a/c I've seen, thanks for sharing it. 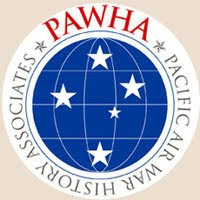 New SE Asia Decals from Crosswind Hobbies!